This illustration is acrylic and ink from the wordless picture book, SHHhsss, I sketched the storyboard in 1985, when my children were in the preschool, which I ran in my home. The animals are the children who came; the image suits each one. Dog gives the party, cat helps with the balloons, and rabbit counts, squirrel wants. On each page the reader (parent and child) counts the sets of balloons, gifts, and animals up to number 10. Then SURPRISE! raccoon enter we have number 11. 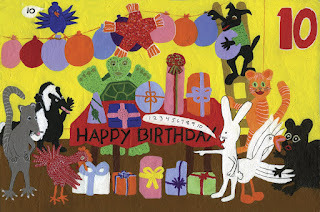 I painted the illustration while in Patricia Polacco's studio, when she lived in Oakland in 1990's. Sarah Wilson was my mentor for the Nevada SCBWI program in 2006. Then I restarted my dream as a picture book illustrator. 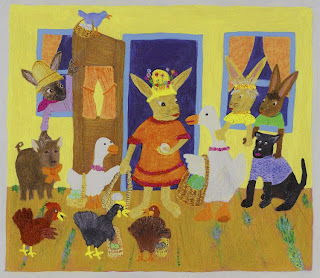 This acrylic illustration is from the story BASKET OF EGGS. 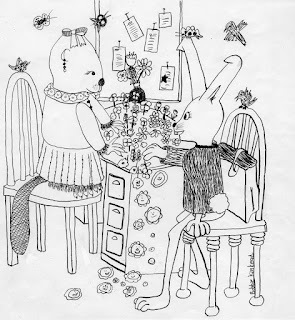 A creative bunny, Vanitta, always gives gifts to the Brice children, this year Heneritta asked for the eggs and Vanitta must find another way to have her eggs for the baskets. There I am, Bobbie, in New York City, visiting an editor of the publishing house, Mary Chase of Holiday House, then, 1986, WOW! I was as green as new sprout, entering preschool. I had my drawing skills; and I was learning how to be a story writer as a member in SCBWI. Green as they come, that was Bobbie. I flew to New York City with Patricia Polacco and Elisa Kleven, now extremely successful, and still my friends. However, I got involved in SCBWI, the Society of Children's Book Writers and Illustrators. I needed an education on how to present a story. I continued the chapter in the Bay Area of California, started by Geraldine Lanier. I wrote and published the newsletter, galleys, held conferences at Asilomar, and started critiques groups. Sarah Wilson and Patricia Polacco helped as did many: Ellen Leroe, Karen Dean, Dorthoy Slate, Kathy Pelta, Marty Rice, Shirley Climo, Pat Kite, Marisa Montes, Mary Banks, Nancy Etchemendy, Joan Arvold, Liz Penatcoff, Bobi Martin, Karen Cushman, Nancy Rains Day, Joy Hulme, and Jacquelinne White. (See the post of the 25th Anniversary of SCBWI Asilomar.) All have many books published. So today, here is Bobbie, as a graduate of illustration, Colorado University (my bachelor's degree); a graduate of writing, SCBWI, (my master's) and a graduate in storytelling, Asian Art Museum in San Francisco, (my doctorate). At last, I'm revisiting art and children's books by means of the web -- so, my portfolio blog is here to show those achievements. Now, all books published as ebooks.